Astron Solutions National Director Jennifer Loftus was quoted in the article “On-Demand Pay Apps Are Catching On,” a story on daily pay apps. As Astron approaches our 20th anniversary, we continue to enhance our quality talent management products and personable services with some new changes. Flare®, Astron’s web-based talent management system, debuted in March 2008. Preceded by the EasyHR Kit, Flare® was developed in response to the increasing need for technology in Human Resources. Job Description Module: Quickly create, edit, and keep job descriptions up-to-date. Performance Management Module: Save time, improve accuracy, and eliminate frustration by taking performance reviews online. Pay for Performance: Determine merit-based pay increase quickly, efficiently, and accurately. Gamification Module: Make work fun! Award points, badges, and trophies to employees for the completion of assigned tasks and activities. Redeem points for prizes that increase healthy competition and employee engagement. All of these features and more are available at the same Astron quality and with Astron’s affordable pricing. In Flare®’s 10th year of release, the Astron team has further enhanced Flare®’s technical quality and pricing structure, and has started on soon to be released expansions. And now, Astron introduces Flare®’s very own website! Learn more about Flare®, view videos, and explore our new employee based pricing at www.flaretm.com! 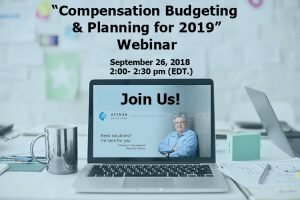 If you haven’t done so already, please be sure to register for our upcoming webinar “Planning for 2019 and Compensation Budgeting.” This concise, interactive, data-filled presentation will help you on the road to successful compensation planning! You can learn more and register at https://attendee.gotowebinar.com/register/4205976510804728578. See you on September 26th! Jennifer Loftus was interviewed about Astron’s experience working with the Zicklin MBA students and their insightful consulting. We have plenty of topics to discuss with you in 2018! See below the listing of webinars slated for the rest of 2018. Register to as many as you’d like! Spring 2018 Salary Survey of Louisiana Opening Soon! The Spring 2018 Salary Survey of Louisiana healthcare organizations is a little less than a month away! Now in its 17th year the survey will open on April 2nd 2018. Healthcare organizations from the Louisiana area can contact Cassandra (cdcarver@astronsolutions.com) to confirm that a participation link will be sent on opening day. Recorded Copies of the “Getting to Know Flare®” Webinar Series Available! Under the “Resource Library” section of our website a “Getting to Know Flare®” page has been added for those that may have missed our live webinars. The section will be growing as more webinars are held throughout the year. Feel free to catch up on all that Flare® has to offer! A Brand New Webinar Series for 2018! 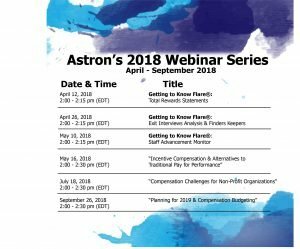 Starting January 24th, 2018 Astron Solutions will be hosting a series of HR-based webinars. A total of 11 webinars will be hosted, ranging between 15 – 30 minutes. 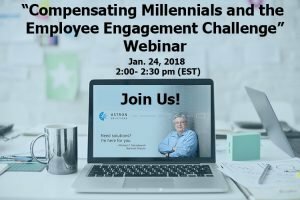 The first webinar is entitled, “Compensating Millennials and the Employee Engagement Challenge”. As of 2016, Millennials now comprise the largest segment of the United States population and increasing each year. This has created challenges to human resource professionals in the development of total rewards programs that will enhance the engagement of this group. This webinar will explore the engagement “triggers” for millennials and review alternative rewards strategies to be considered. Since the end of the recession, more and more baby boomers have been deferring retirement. The unexpected result is that many employees from this generation are being paid well above market value for their jobs, forcing organizations to cope with serious pay compression. Not surprisingly, studies from SHRM and WorldatWork indicate increasing employee dissatisfaction over the ways compensation programs are administered and communicated, especially as it relates to those nearing or exceeding maximum job value. In this exclusive HRCI/SHRM training, compensation expert Michael Maciekowich, National Director of Astron Solutions, will share his 30 years of compensation expertise as he presents recent research and provides alternatives to the status quo. How to understand the wants and needs of the veteran (1909 – 1945) and baby boomer (1945- 1965) generations in the workplace. Critical insights from SHRM and WorldatWork studies on how human resources addresses the needs of these generations in the workplace. A comprehensive overview of Astron Solutions’ focus group research, including data acquired over the past five years from more than 100 clients across various industry segments. The dilemma of utilizing pay range maximums and why they are needed. Sample alternative, non-salary reward programs, including those considered best practice and those that have failed, as well as an outline of the process employers can use to establish programs to suit their organizational culture and needs. Join is on December 13th 10am PT/ 1pm EST! Join Michael Maciekowich on October 30 (1PM EST/10 AM PST) as he presents a webinar that explore strategies to better understand and control unplanned overtime. Reviewing the FLSA’s overtime requirements. Discussing how unplanned overtime occurs. Identifying proven financial and employee relations strategies for forecasting and controlling unplanned overtime. Join us for an exploration of compensation planning for 2018! The latest in variable compensation. Join us live on September 14th to obtain the insights you need to be successful in 2018. Can’t join us on September 14th? All registrants will receive access to a recorded copy of the webinar. You won’t want to miss this essential information! Click here to register for our webinar! SHRM reached out to Astron Solutions’ Jennifer Loftus to explore the use of Paid Time Off (PTO) banks, rather than traditional vacation & sick time programs. Newsday reached out to Astron Solutions’ Michael Maciekowich to speak on how companies are turning to performance-based bonuses to attract talent, instead of relying on hefty raises. You have come to know Astron Solutions, LLC as the human resource consulting firm that stays one step ahead of the curve in cutting edge total reward and talent management services. Now we have a website to match. We are excited to announce the launch of our new website. Come check us out. If you haven’t visited for a while now’s a chance to catch up with Astron Solutions LLC. From FLSA changes to the latest in Gamification, our new site provides an entry into total rewards and talent management innovation. On May 18, 2016, the final ruling was released, updating regulations defining which white collar workers are considered protected by the FLSA’s minimum wage and overtime standards. 3. Establishes a mechanism for automatically updating the salary and compensation levels every three years to maintain the levels at the above percentiles and to ensure that they continue to provide useful and effective tests for exemption. Astron Solutions National Director Jennifer Loftus was quoted in the article “Up Close and Personnel,” on the history and role of HR today. National Director Jennifer Loftus is quoted in the July / August 2015 issue of Associations Now magazine regarding trends in employment and compensation. You can read the article, entitled “Hire Power: Finding Employees that Match Your Needs“. National Director Jennifer Loftus is being honored with the 2014 Gotham Comedy Foundation Lifetime Ambassador of Laughter Award! Please join the festivities on September 17th for a fun evening while helping others! National Director Jennifer Loftus is a contributor to Infusive Solutions’ latest publication, The Cheat Codes to Beating Software Development Interview Processes, which has recently been turned into an infographic. The infographic leads job candidates through several levels of interviews in a format similar to those experienced in video games. Jennifer explores level 1 interviews with the Human Resources professional. National Director Jennifer Loftus is a contributing author to Infusive Solutions’ latest publication, The Cheat Codes to Beating Software Development Interview Processes. The guide leads job candidates through several levels of interviews in a format similar to those experienced in video games. Jennifer explores level 1 interviews with the Human Resources professional. Obtain your copy of the resource. On October 3, National Director Jennifer Loftus will partner with Elizabeth Moore, PHR of the Holmes Corporation, to lead a webcast entitled How to Prep for the PHR/SPHR Exam with the SHRM Learning System. Attendees will receive tips on preparing for the HR Certification Institute’s PHR and SPHR exams, as well as find out how the SHRM Learning System can boost test preparation efforts. Note: This webcast does not qualify for recertification credit. Register for the webinar, which is free to SHRM members. For more than forty years, MKA has been at the forefront of retirement income planning for executives, business owners and professionals. For more information please visit www.mkaplanners.com. National Director Jennifer Loftus was recently quoted in the US News and World Report article 4 Reasons Your Resume is Thrown in the Trash (And How to Pull It Out). The article explores potholes job seekers encounter when applying for positions, and ways to avoid them. Inc.com recently quoted National Director Jennifer Loftus in the article How to Interview a Recent Grad. The article succinctly provides tips interviewing candidates who are new to the job search process.